The Iraqi army launched a combing operation in Anbar’s deserts towards the Saudi borders to clear the area of remaining ISIS elements. Iraq announced the end of IS in Iraq last December after a military offensive that ousted the terrorist group from its strongholds in predominantly Sunni areas. “The operation aims to chase Daesh remnants in the western desert and destroy their positions and hideouts,” Anbar Operations Commander Maj. Gen. Mahmoud al-Falahi told the media. He said tribal fighters and US-led coalition warplanes were taking part in the offensive. 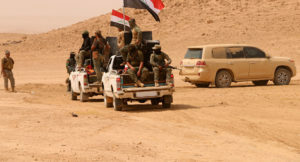 The vast Anbar desert areas in the province are the last refuge of the ISIS militants in Iraq after troops and paramilitaries ousted them from both valleys and all urban areas. Written by: Jaber Ali on February 4, 2018. Posted by Jaber Ali on Feb 4 2018. Filed under Headlines, World News. You can follow any responses to this entry through the RSS 2.0. Both comments and pings are currently closed.